Easter is coming and I was interested in baking some cupcakes with a solid/praline-filled chocolate surprise inside. Please refer to the image below. Little side note: I will put smaller chocolate eggs inside and don't want them to be visible, they will be totally covered by cupcake batter, as opposed to being as you see them in the image. 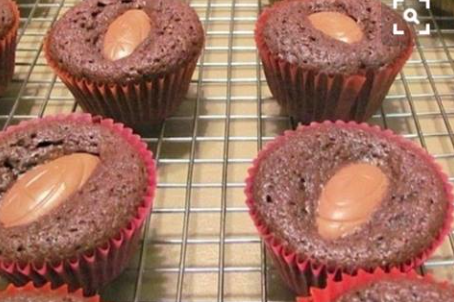 I was wondering: if you put chocolate eggs inside the cupcake dough and let it bake in the oven, will they melt? And how badly? I was hoping for some advice how to have a bit of a chocolate egg surprise in my cupcakes, instead of some melted chocolate 'cream'. Whether the chocolate melts will depend on which chocolate you use. One with more cocoa butter will melt, while one made with more soy lecithin will retail its shape. That is why most chocolate chips contain soy lecithin. You will need to choose your chocolate according to what you want it to do in the oven. Not the answer you're looking for? Browse other questions tagged baking chocolate cupcakes or ask your own question.